On my way back from the recycling center, where I had dropped off 4 (count them 4!) phone books, I decided to stop at Yates Mill. For those not in Raleigh, it's simply an old mill on Yates Mill Pond that has been preserved and has a walking trail around the lake. Now that I've been there I can say it's a great way to spend an hour walking around and enjoying the out of doors. The thing that was particularly great about this stop was that my brain decided, for some odd reason, I should turn around as I was crossing the stream by the mill. As I turned I caught sight of a small turtle in the stream. This isn't too remarkable in and of itself but it was eating a crayfish (or crawfish or crawdad if you're from the south), and doing so rather viciously. I was completely fascinated watching this turtle eat its meal. I have never seen a turtle eat anything other than boring old vegetation. Much like a dog, it would hold its quarry out with its legs and then rip with its teeth. The neat thing about how it works is the turtle uses its retractable neck to do more of a straight pull than a dog, who is limited to sort of a sideways rip. Very cool. To the right is a not-so-great picture taken with my lame camera phone. It's low res so a little hard to make out but that's all I could do lacking a camera. 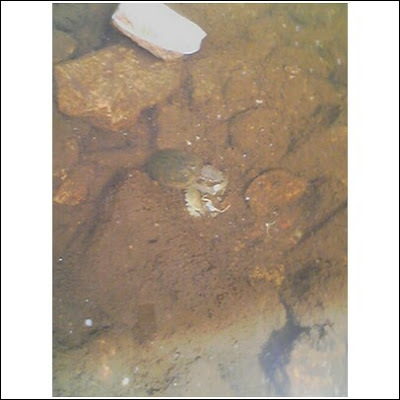 The turtle is in the center and the crayfish is the white stuff around it. The other sight for today occurred while I was out at Middle Creek playing disc golf. Coming up to the 16th tee I spotted a cardinal which had the most brilliant red I've seen on one. It was very deep, rich, and dark but at the same time extremely bright and radiant. It's very hard to explain, just trust me, seeing a plain old cardinal is not something I'd think is noteworthy. Okay I'm a day late but yet again not a whole lot to say. I've been playing so much disc golf I developed and popped quite a large blister right on the index finger where the disc rips from your hand. I also ordered a few new discs that I can't wait to give a try. Also have been pounding through Tales of Symphonia. It is one MASSIVE game, I think I'm about 1/3 of the way through (if that) and I'm somewhere around 30 hours played already. This is like Neverwinter Nights all over again! Getting ready to pack up and leave Raleigh to head back to old Cincinnati-town... only to return to the Triangle again in June to teach at Duke. Moving is such a hassle, but it's great to clean out even more stuff than my "great purge" of earlier this year. Sending a bunch of old towels to the animal shelter and clothes to Goodwill too. I just saw this wonderful article at Lifehacker and I really like these tips. The article is aimed at Sprint customers but I'm sure Verizon, ATT, and others have similar options. It mentions using your setting to turn off caller information (so you don't have to wait for it to say date, phone numer, etc. of the person who called before each voicemail) and to enable expert mode (cuts down the bot chatter to more concise speaking of menu entries). The most important, which everyone should do, is disabling numeric paging. I had no idea this could be done and it's really annoying when I'm getting ready to leave someone a voicemail and have the bot ask me if I want to leave a numeric page. No. No one does. Ever. Let's all take this off our accounts and make the world a happier place. Another week of "not much." Did the gym, exercise, and disc golf as I should and have part of a crossword waiting to be finished. One of my disc golf rounds was played with Dave "Peanut" Brittle, who is apparently a pro and was, at one time, very highly ranked. He beat me by 3 or 4 strokes playing from the white tees, so I think I held my own fairly well. I'm still trying to get the hang of varying throw strength. I also played a lot of Tales of Symphonia this week, so I guess that counts as progress on getting all of my currently owned games finished. I forgot to mention that last week I finished Order of the Phoenix and this week I sprinted through the Half-Blood Prince, so the Harry Potter series is nearly at an end, which is sad. I went to get the paperback of Deathly Hallows today and I couldn't believe that there still isn't a paperback out yet. Supposed to be coming out this June, roughly two years from the hardcover release, which I think is a bit excessive, especially since the British paperback has already been available for a year. Well I'm sticking it to the publisher for such outrageous policies: I bought a used copy off Amazon Marketplace. The other important happening this week is that I made the decision that I won't continue through with the PhD at NCSU (I received a Masters this past December). It's been bouncing around the old brain for a while and, as I began seriously considering it, it seems the right thing to do. I'm going to apply to U of Cincinnati and try to enter their Mathematics PhD program and return to cryptology. If that doesn't work out I'll be on the job market! Wish me luck! Fox News makes bold, BOLD predictions! Okay, maybe the title is a bit of a stretch. But I must say new, quality TV shows and movies are getting extremely hard to come by; studios won't take risks, movies are heavily biased towards established franchises, and TV shows follow the same old formulas (he solves crimes but he's a MENTALIST and can make up stuff no one could really do!). Yes yes, I realize shows are often more about the characters but there still has to be something interesting for those characters to actually do. Independent and foreign films do still show the quirks and sparks that I appreciate, but I'm talking mainstream here. As my Grandpa Leroy so often pointed out, commercials are one of the few things left watching on TV. I was sitting the other night admiring yet another AT&T Wireless commercial looking for the "signal bars" they have hidden in nearly every scene. When they, as Cingular, started this a long time ago they were explicit about pointing out the bars but now they are there just as a sort of Easter egg for those wanting to look for them. Though they do not spend a lot of time, effort, or money on that the thought is appreciated, and many of the below ones did incur significant costs in those categories. I've compiled a list of some of the better commercials I remember, there were a few I had vague recollections of but not enough to look them up so add your own in the comments. And finally I think Apple's "I'm a Mac/PC" ads deserve a mention. Very funny and they are a stroke of brilliance. However, these do not entirely make up for the misery contained in their other commercials of recent years. I'm sure everyone has seen the new GM advertising campaign by now. The smiling average Americans doing American things and everything is just peachy. The sun is shining and people are just happy to be alive. They are wearing their rally caps and washing their GM cars that they love so much that they bought to support "the team." Simple fact is GM has fallen behind the curve and is not making products anyone wants to buy right now. And I have to hope and pray that people aren't going to fall for this lame Hail Mary at trying to save their business. It's simple GM: simplify your brands, simplify your offerings, offer a la cart add-ons instead of lame packages, raise quality, and make the cars people want rather than what has the highest profit margins. You had an amazing opportunity years back with Saturn and you blew it. You never learned your lesson and you're going to pay for it now. Consumers aren't going to buy your product to be patriotic. Much like several of my entries not much new this week. I was able to update my list a bit by making it look better on my website and doing some restructuring. I created a new "Talents or Hobbies" section, moved several items there, and wrote in a few more like completing a Rubik's Cube. I had intended to get to the gym this past Saturday to get in my exercise item but it was closed all weekend due to Easter. I also didn't have a meeting with my advisor (I now have the Gabor filter finished so I actually did want to see him, darn) so I did not have a chance to pick up a Technician to do the crossword. So I'm going to chalk these up as "not my fault" and take off the total tally for each of these rather than not getting a point in progress. Most of my week was taken up by my friend Sarah visiting. We had a good time and hit the science museum, WRAL's Azalea gardens, and Umstead for a hike. We had intended to go to a play (another list item!) but no one really had anything showing in the middle of the week while she was in town. I actually kind of regret she didn't have a bit more time where we could have done a few more things, like hit a Durham Bulls game, check out the art museum, and visit the Flying Saucer. Oh well, I guess there's only so much one can do in two days. I forgot to add that yesterday was quite a day for finding lost items. At Cornwallis I found a nice multi-tool pocket knife on the road close to my car. It may have been the guy's who was parked behind me, but I couldn't be sure and I didn't want to leave it sit somewhere where either 1) a car could run over it (it has a corkscrew) or 2) someone else would just take it. It's not particularly amazing and isn't branded so it couldn't be worth too much... I hope. The second item was found on a stump seat on the course at Valley Springs. It is a microfiber cloth that was laid out over the top of the stump like a guy had used it to dry his discs while waiting to tee off. I assume it is from someone in the tournament and odds are they were not going back for it so I do not feel as bad about this one since it probably would have blown off the stump and deeper into the woods by the storm today and never been found again. What makes it kind of interesting is it has a patch that marks it coming from Calapooia Brewing, which I've found is in Albany, OR, and it apparently came from Festivus Six. This fact made me quite excited. Festivus for the rest of us! Not anything big on this update because mostly what I did was incremental. I've made it back to the gym--as my sore muscles can tell you--so hopefully I can keep that up now. Pilates and yoga are definitely good workouts but I think the gym is needed to supplement. Got in some quality disc golf rounds, especially today (hit Cornwallis and Valley Springs up in Durham). I thought I was starting to develop some consistency but my round at VS was not overly impressive; my short game saved my poor drives. I had meant to do my bike tune-up item today but I was in Durham longer than expected. I originally set out just to play VS but when I got there it was the tail end of a tournament so I went and played Cornwallis to bide some time until VS was reopened to the public. Still working on learning Drifting for guitar but am making progress. I also wrote a nice little D-C-G pick/strum combination that I can probably put into my future song for the list. Finally got back on the video game horse by getting back into Tales of Symphonia. It had been so long I had almost forgotten what I was doing. The story is motivating but the combat is still a drag. Finally, Travis and I had some time to look at hiking routes and it looks like we'll be doing the Art Loeb and some surrounding hikes, which will mark off yet another list item in May! My long ago sprained ankle is almost back to fighting condition so I think I'll be able to take up racquetball with Jon again, let's hope I don't sprain it again on my first outing. Ahhh yes, it's Spring time again. Don't I listen to the groundhogs and official seasons? No, I pay attention to other things. It's warm, the sun is out, people are wearing shorts, the grass is growing at an obnoxiously fast rate. 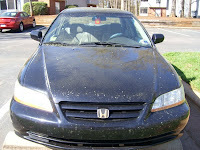 Most importantly, however, my car is covered daily in a fine yellow powder: tree pollen. There is no winning battles against this menace and there is absolutely no hope of winning the war. No matter how nice your car looks one day, it'll look like complete garbage the next. See for yourself... these pictures were after one day of pollen accumulation. Well I pondered doing an April Fool's joke but, considering my readership is probably one (myself) I didn't want to spend the time crafting the perfect joke. I will however pass on a nice, legitimate bit of math and nerd humor. Check out PC-BSD and notice--besides being an alternative OS you should try out instead of Windows or Mac--what the new v7 is being called. That's right, the Fibonacci Edition. The only problem is 7 isn't a Fibonacci number. Math fail!